Biblical scholar Craig Blomberg surveys relevant passages from both the Old and New Testaments on the subject of possessions, the place and purpose of wealth, and the Christian way to demonstrate the gospel through our approach to material blessings. Without denying the good created purpose of wealth, both testaments warn us about the idolatry that loving our own wealth or coveting another's can generate. Christians must be aware of and safeguard against the dangers that abusing material wealth can produce. 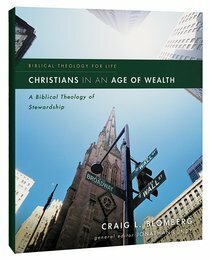 Blomberg explains the biblical teaching that when we give away generous and sacrificial amounts to those in need, we participate in God's original good design for abundance and demonstrate the active love of Christ. As part of the Biblical Theology for Life Series, this book provides pastors, teachers, and lay learners with first-rate biblical study while at the same time addressing the practical concerns of contemporary ministry. Christians in an Age of Wealth encourages and challenges readers to embrace a fully biblical perspective on wealth. About "Christians in An Age of Wealth: A Biblical Theology of Stewardship (Biblical Theology For Life Series)"
Dr. Craig Blomberg (Ph.D., University of Aberdeen) is currently a distinguished professor of New Testament at Denver Seminary, before joining the faculty he taught at Palm Beach Atlantic College and was a research fellow in Cambridge, England with Tyndale House. In addition to writing numerous articles in professional journals, multi-author works and dictionaries or encyclopaedias, he has authored or edited 15 books, including The Historical Reliability of the Gospels, Interpreting the Parables, Matthew (New American Commentary series), 1 Corinthians (NIV Application Commentary series), Jesus and the Gospels: An Introduction and Survey, Neither Poverty nor Riches: A Biblical Theology of Posessions, Making Sense of the New Testament, Preaching the Parables, and Contagious Holiness: Jesus Meals with Sinners. How are Christians to respond biblically to the radical degradation of natural environments occurring in our time? Bringing together their expertise in biblical studies and science, Doug and Jonathan Moo trace key themes through Scripture that situate the created world within biblical theology in general.